I don‘t know where this salad is actually from. But I am sure several nations claim to be its country of origin. Since my Mom always makes it for me, I guess it is Bulgarian. But, it may as well be Latin American or Italian of origin. Rumors wants it that it stems from a Chilean cousin of my mother’s who was taught it by a friend of hers of Palastinean origin (did you know that chile had and still has a relatively large Palastinean immigration). In any case, wherever this salad is from, I now need to write a little appraisal for it! 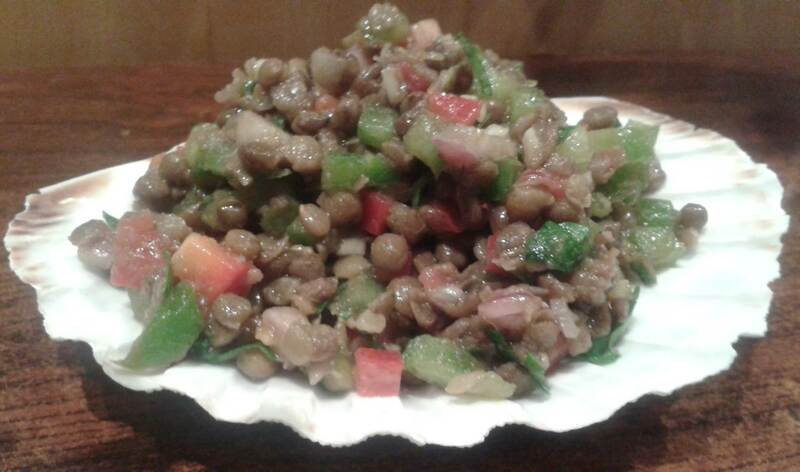 It is a salad mainly composed of brown lentils. There are tons of different types of brown lentils out there – in each country they are given different names. I guess, that in English the word for the kind of brown lentils I mean is pardina lentils. They distinguish themselves from other brown lentils by being less needy of elaborate cooking efforts. 200g lentils need only around 20-30 minutes of cooking in boiling water (in a ratio 2:1 water to lentils) to become soft. Of course, times can vary so always try the lentils first. Once the lentils are cooked remove them from the heat plate. Discard excess water and allow the lentils to cool down. This gives you the time to prepare the other ingredients. Of course, you do not need to prepare the salad immediately; you may leave the lentils for up to 3 days in the fridge. Besides lentils, the most important ingredient of this salad is green bell pepper. Per 200g lentils, add half a green bell pepper. If you want also add half a red bell pepper. Cut both of them into small pieces. How small? That depends on you – but let’s say the finer the better. Besides, the bell peppers onion (1 per 200g lentils) and garlic (2-3 cloves) cut into very small pieces. The secret to intense taste is to salt both the cut onion and garlic before adding it to the salad. Allow the salt to soak in for 10min. Last but not least add as much parsley (cut into small stripes again) into the salad and add olive oil, lemon juice and salt. The salad can be stored in the fridge up to 3 days – it fits for dinner, lunch and breakfirst or as a small bites in between. It can be served both as side and as main dish and it is very well-suited for any kind of diet.